Cannibal doctors, fascists, corrupt hospitals, hit-men, drugs, organs, and head implants! Follow CIA agent Clark and his rag tag team as they seek to oust corruption from a pair of highly corrupt hospitals and trigger a greater nationwide reform of the medical system in the process. The book considers the exponentially increasing number of deaths from preventable medical errors, and the CIA's attempt to oust corruption from hospitals - more specifically, the "murderer doctor" demographic, of the three main types of preventable medical error deaths (intentional, accident, and negligence). 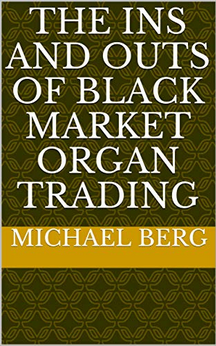 The book's story focuses on two highly corrupt hospitals where cannibalism and black market organ trading are occurring. Just in time for Halloween - This is the first book I've ever written, hope you enjoy it! Feel free to ask me (the author) anything in this thread! I actually wrote this book with the intention of saving lives by pointing out the exponentially increasing number of deaths from preventable medical errors, which are right now the third leading cause of death in the United States (behind Heart Disease #1, and Lung Cancer #2). Deaths from preventable medical errors were doubling every 10 years, and if the 2014 statistic of 470,000 deaths from preventable medical errors is accurate, they are doubling faster than every 4 years. I'll move this to the non-fiction forum.